Brain after stroke. 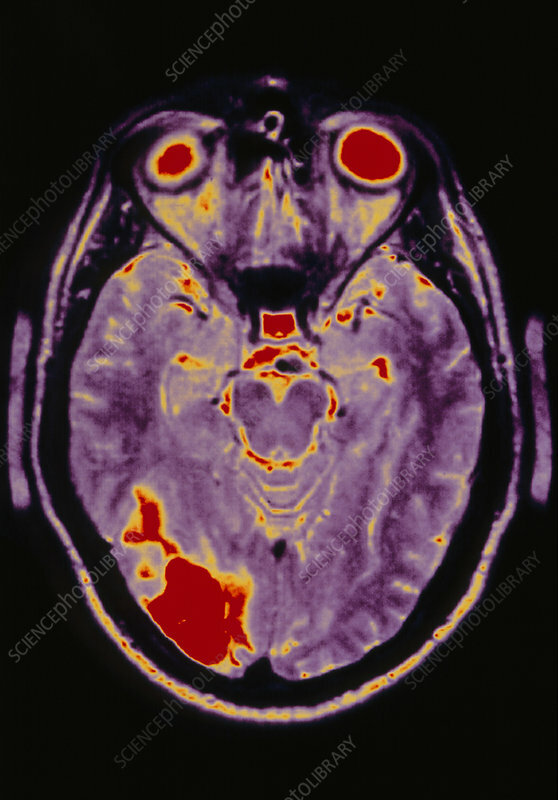 Coloured computed tomography (CT) scan of a brain affected by a cerebrovascular accident (CVA), or stroke. The scan shows a horizontal slice through the head, with the eyes (red) at upper centre. Tissue damaged by the stroke is at lower left (red). A stroke occurs when a blood vessel in the brain ruptures or is blocked, disrupting blood flow and cutting off the supply of oxygen and nutrients to the tissue. Damage from a stroke can cause a variety of symptoms, including weakness or paralysis in parts of the body, and speech impairment. Extensive damage to the brain can lead to death.